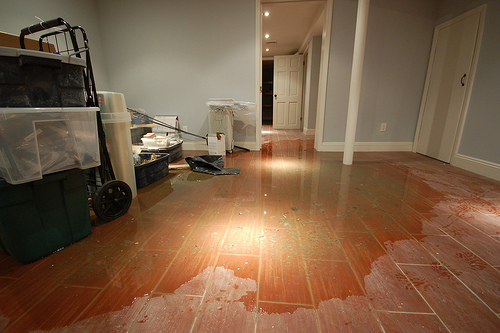 Philadelphia » Blog » Water Damage Restoration » Water damage: Don’t get submerged by it! Water Damage restoration can be a very demanding process. The most effective way to go about it is to prevent water from ever entering your home. I know that this is a lot easier said than done. That is because water numerous ways it can enter into your home. There’s a long list of natural causes and technological failures that leave countless homeowners with wet basements every year. Some natural methods would include floods, storms, rain leaks, and pipe bursts. While instances where our technology fails us would include water heater leaks, sewage and plumbing leaks, a faulty fire sprinkler or washer machine, a ruptured hose, and much more. If homeowners discover that water has found its way into their homes, then there are several procedures that must be followed to restore or repair any material damage, as well as prevent dangerous mold from growing. The first of these procedures is flood cleanup. This means that the water must be removed. In order to do this, homeowners will need a submersible water pump. The pump will be used to remove most of the water from the basement. These pumps are often gas powered to avoid electrical injuries. After the water has been removed, the area must be dried and assessed for damaged materials. The drying process is incredibly important. Failure to effectively dry an area will promote for the growth of dangerous mold after only 48 hours. Mold can be hazardous to your health, difficult to remove, and can significantly reduce the value of your home. You cannot simply open your windows until your carpets dry out, because there may still be moisture underneath the carpet that would still allow for mold to grow. The latest drying technology requires the use of a dehumidifier. A dehumidifier will remove all of the moisture within an enclosed area. After the area has been successfully dried, you may begin to access damaged material. Some materials within your home may just require a simple cleaning from you, others, such as damaged drywall, may require some handiwork to be done. Items such as electronics will likely be damaged beyond repair. Due to the emergency nature of flooding, and how quickly mold can form, many local businesses offer same day service. These businesses provide the required materials such as the pump and the dehumidifier. They also provide experienced and efficient water removal services, restoration services, and water recovery for damaged items. If you find yourself tasked with flood cleanup, I recommend leaving it to the professionals, and contacting your local businesses.